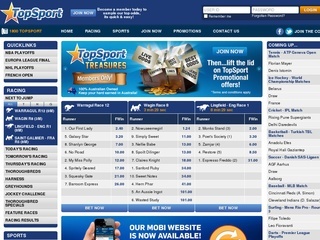 Topsport is a very new online bookmaker in Australia. It is owned by Lloyd Merlehan and his son Tristan. The Merlehan duo has about 25 years of bookmaking experience. Not many punters know that Lloyd is the first licensed on course bookmaker to offer sports betting service back in 1990. The Merlehans launched their new website, Topsport, in 2013, just in time for the Melbourne Spring Carnival. Then and there the owners offered refunds for bets that finished 2nd or 3rd in any of the featured races. This move won Topsport lots of clients and popularity back then. Topsport is licensed by the NSW Government and has the authorization to accept sports and racing bets by telephone and online. The headquarters of the company can be found at the Border Park Racerourse – at Tweed Heads Coursing Club on the Gold Coast. A really important detail to point out – Topsport is a member of the NSW Bookmakers Cooperative. This organization guarantees that winners will get their payouts at all times. The Merlehans comply with all the Australian Bookmakers Association Code of Practice. The website design is quite clean, with the majority of colors being white, gray and blue. The combination is very on the eyes. The interface itself is as easy as it can be – everything is intuitive to find and even new players will not get lost. Topsport offers a nice mobile version of the website. This way you can bet when you are on the move and will never miss your favorite events again. As with all Australian bookmakers, the focus falls on thoroughbreds, harness and greyhound racing. There are lots of specials for these racing types, including Jockey Challenge and featured races. All the regular options are there – fixed win, fixed place, best of 3 totes, middle tote. The exotic betting options are also present – quinella, exacta, and trifecta await your bets. Topsport covers all events happening in Australia and a select few from overseas. If it’s from Oz, you’ll find it here. The sportsbook covers more than 25 sports. Customers can enjoy putting their money in sports like Soccer, Hurling, Pool, Motor Racing and others. The soccer bets are numerous, and you can find most of your favorite markets there on Topsport. Sadly, the sports betting isn’t as advanced as most other bookies, but the essentials are there, including three types of Asian Handicap. The markets should be enough for most players. Like all other Aussie bookies, casino games and poker are not available. That is, again, not the fault of the bookie, but the laws in the country. The odds on Topsport are quite competitive. The Merlehans have lots of experience and know how to turn up a profit, while offering an excellent betting service. The best paying options in the racing section are the quinella, trifecta, and win. Of course, the exotic bets are hard to get right, and you will lose more often than not, but the wins will be worth your while. The most lucrative markets in Soccer are, of course, the correct score, over/under goals and the Asian handicaps. If you want to win big, however, you shouldn’t count on the large numbers in the payout section. Trust your skills and bet big on small, but more probable bets. The security of your bets is absolute. As I said before, Topsport is a member of the NSW Bookmaker’s Cooperative. This is the body that guarantees that all winning payouts are delivered on time. The Aussie bookie has proven its fair play methods and because of that, it’s gaining more and more popularity with numerous punters. Customer service in Topsport is marvelous. The owners prefer the personal contact and thus will sometimes answer inquiries themselves. You can reach the company by phone, e-mail, fax and the post office. You are guaranteed an answer within 24 hours of sending your question. The details are here on the table. Topsports only accept AUD as a currency, but since it’s Australia based, this shouldn’t be a problem. The deposit and withdrawal methods are the usual, plus a few extras. The online bookmaker accepts all the modern ways to transfer money between accounts. You can find all the details here on this page. Keep in mind that usually the fastest ways to transfer money is to use credit cards or BPAY. The promotions on Topsport are a lot but are not direct cash bonuses. Most of the offers are for money back. The promotions switch with time and the featured matches change as the events go by. The money back Bonanza is a very good grace if you lose bigger bets. Overall the bookie is of great quality, and you should give it a shot!